Enclosures protect electronic circuits from external forces and facilitate comfortable transport and secure operations. Our shop carries a vast assortment of enclosures and cases in various shapes and sizes, for example the aluminium enclosures by BOPLA which are both durable and suited for industrial application. Due to their high chemical resistance to alcohol, benzine and mineral oils as well as their electromagnetic compatibility (EMC), internal circuitry is optimally protected. The encasement features high corrossion and surface protection. Encasements by TEKO have excellent shielding as well. The assortment is rounded off by many different plastic enclosures in various sizes. 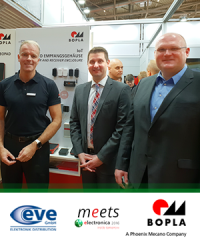 Our purchasing manager Marcus Peters and our marketing manager Michael Kujat met today at electronica with the sales manager, Mr. Thomas Lüke, from BOPLA. 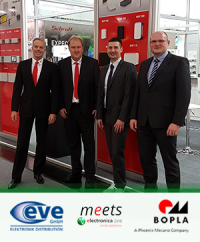 Marcus Peters, head of purchasing, and Michael Kujat, head of marketing, from the EVE GmbH visited sales manager Mr. Lüke and Mr. Wellmann from the BOPLA company, manufacturers of enclosures and membrane keypads, at their booth at the electronica today.